“Safe as Houses; Community Connections” is running again in 2019. We would like to invite Local Community Groups to host a Crime Safety Information Session for their participants. This is open to resident groups, sport groups, senior groups, social groups, school groups, etc. within the City of Hume. Sessions provide information about: residential burglary, theft of, and from motor vehicles, and theft of personal property in public places. We organise the time, date and location with Victoria Police and we provide free information packs to participants. 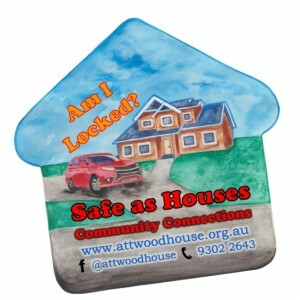 Sessions can be held at Attwood House Community Centre or we can come to you. If you are part of a local Community Group (within the City of Hume) please register your interest by calling our friendly staff at Attwood House Community Centre on 9302 2643.